This is the response of RCA Victor to the Zenith Trans-Oceanic. It is every bit as solid and well constructed as the Zenith, although the plastic shaft knobs are rather flimsy and the dialcord is fiendishly difficult to restring. This set, in common with the Zenith TO, the Hallicrafters TW1000 and their ilk, features that rare beastie of a tube, the 1L6. This tube was made from that rare element 'Unobtanium', and good used examples usually cost more than the whole radio. Allegedly, the European DK92 will work up to around 10MHz and electronic (ie: transistorised) replacements for the 1L6 have also been spotted. 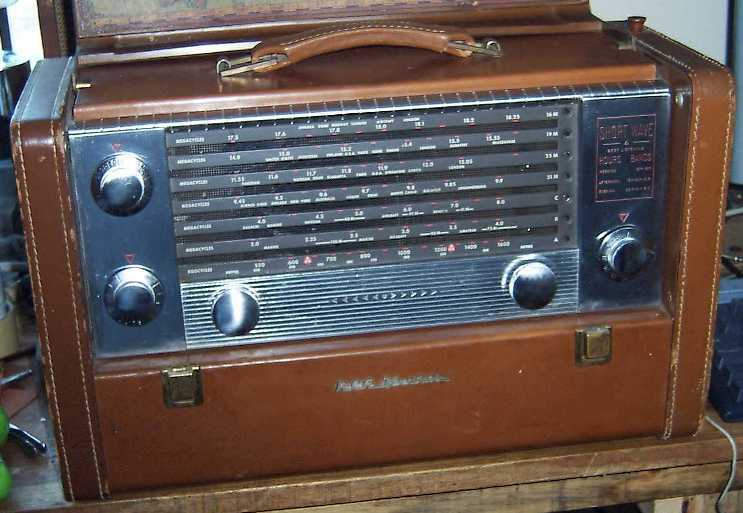 5-BX-672 was an identical model but with a case covered in 'Alligator Grained Leather'. 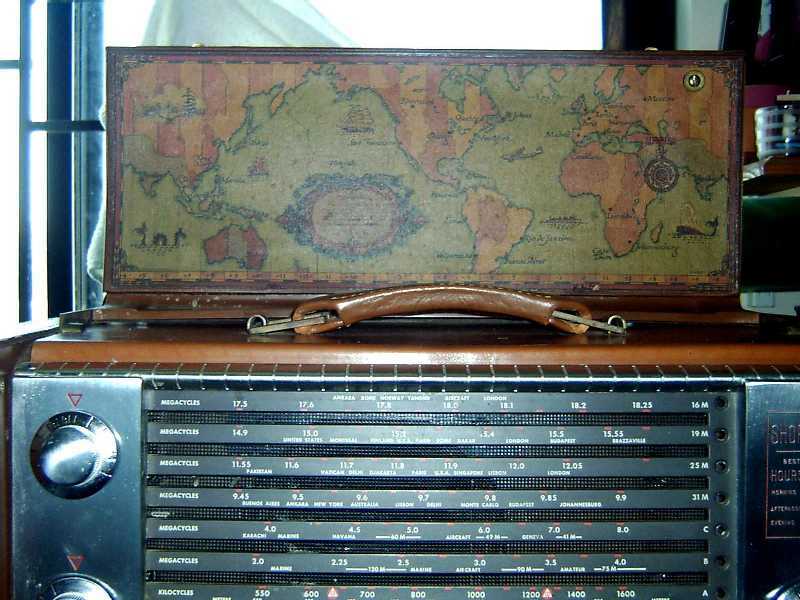 It would be fair to say that the RCA Strat-O-World was the serious contender to the market dominance of the Zenith 'Trans-Oceanic' series for the 'luxury' shortwave portable radio. Although Hallicrafters had their Trans-World series (the TW1000 and TW2000), their branding was somehat diluted by the fact they made the chassis availiable to other manufacturers. 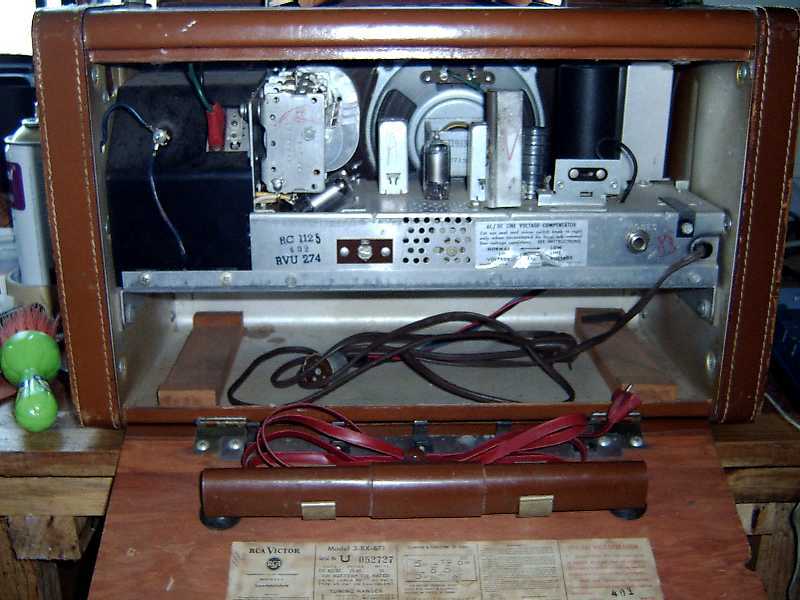 Although the TW1000 was a very good set - with its heavy coil-turret tuner - the case was lacking and somewhat plain. Zenith had the industrial designer Robert Budlong almost on their payroll and Hallicrafters should have asked Raymond Loewy for greater involvement with some of their designs other than the S-38. The RCA set, in contrast to the Zenith, in my eye, looks much nicer. Brown leather covering was a standard feature (as opposed to an extra-cost option on the Zenith) and the 'old-worlde' map on the lid interior is a nice touch. The case itself is sturdier as it is, essentially, a covered metal box and the overall finish seems better. However, the chassis is still the same lightweight sheet steel as other models and evidence of cost-cutting (or is that 'value-transfer'?) becomes evident.